Winter really takes its toll on the family home; the excitement and intensity of the festive season alone seems to take an age to clear up after…not to mention muddy boots in the hallway, wet coats dripping onto the tiled floor, dirty pawprints all over the carpet and that’s just the inside. The outside of our homes takes a battering too! 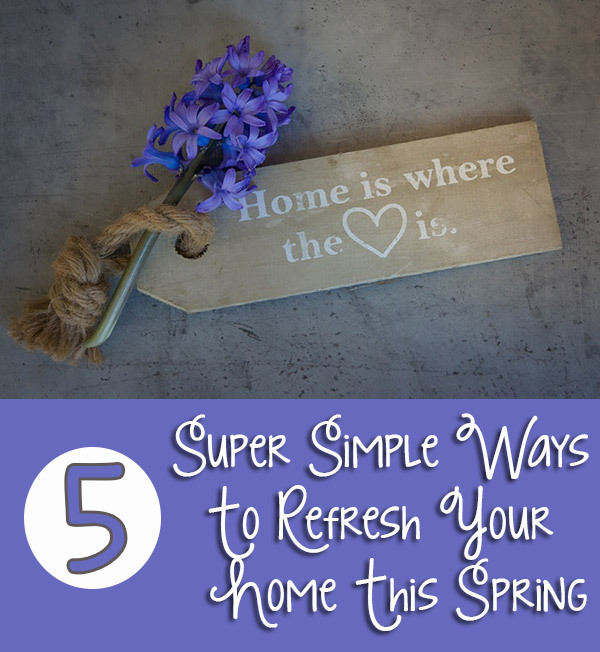 Refreshing your home for Spring is really easy. Sure, you could go all out and get the decorators in – don a hard hat and knock a few walls down – click here for construction signs online – but before you pull on your work boots, here are 5 super simple ways to refresh your home this Spring. Groan! Yes, I know how difficult it is to declutter your home, especially when most of the clutter is actually your kids toys and their belongings. But, if you take some time to go through the main culprits of the clutter and simply remove it, you’ll be amazed at the impact on your home and your mental health! Remember, you can donate, sell or dispose of anything that doesn’t have a home, is no longer used or no longer loved. Don’t feel guilty! Double groan! Cleaning isn’t everyone’s favorite task, and it really is the most laborious chore. But you’d be amazed at how fresh and new your home feels once you’ve cleaned the place from top to bottom! Don’t forget to clean those makeup brushes too! Try moving that rug in the dining room into the living room. Or switch that standing lamp for the table lamp from your bedroom. Before you head out and buy brand new items, try switching some of your current items around first. You’ll love how different they can make a room feel. And the best thing about it? It’s free! There’s nothing that says Spring more than some gorgeous greenery and some beautiful blooms. So, why should the vivid colours and bursts of Spring be limited to the outdoors? Treat your home to a couple of beautiful houseplants – or false ones if you struggle to keep plants alive – and place them in various rooms. It’s a super simple way to add colour to a room too. Remember, less is more when it comes to introducing colours and patterns. So consider adding a couple of brightly coloured cushions to your sofa or hanging a colourful piece of artwork from the wall to make a focal point. It’s a fun way to add colour that isn’t as permanent as new wallpaper!